MCCN celebrates the start of the 2017-18 academic year! A total of 1,064 students are enrolled, including our 201 of our newest undergraduate students and 70 graduate students. Wishing our Nightingale family of faculty, staff and students a healthy, happy and successful New Year. Welcome to a new year: The 114th academic year since the founding of Mount Carmel. It is a privilege for me to begin this year with you – serving you – as your interim president at Mount Carmel College of Nursing. We have so much to look forward to together. I especially want to welcome our newest students, the class of 2021. 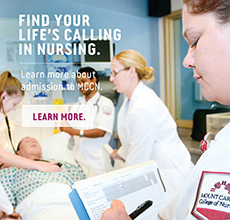 As I shared at Convocation last week, we are all honored you have chosen to answer your life’s calling to become professional nurses and especially that you have chosen to do so at Mount Carmel College of Nursing, an outstanding, fully accredited institution of higher learning. Each year, the Ohio Association for College Admissions Counseling (OACAC) offers an onboarding conference for all new Admissions counselors. The event was hosted by Bowling Green State University this year and included over 300 attendees. MCCN director of Enrollment, Kim Campbell, PhD, was asked to mentor six of the new counselors at this year’s OACAC Summer Institute. MCCN welcomed new students at the Annual Minority Student Reception on Sunday, August 13. More than 40 students, faculty, alumni, friends and families joined the festivities, hosted by Kathy Espy, Dr. Shirley Cooley and Dr. Kim Campbell.